What about hypothermia in this chilly weather? What if the current in the river is strong? What about privacy? We’ve not had a chance to see the canvas structure on the riverbank. How flimsy is it? And how long will it take for so many people to submerge separately? These were among the topics of discussion concerning the mikveh, the final ritual in the process of the Jewish conversion of more than 100 Malagasy men, women and children. 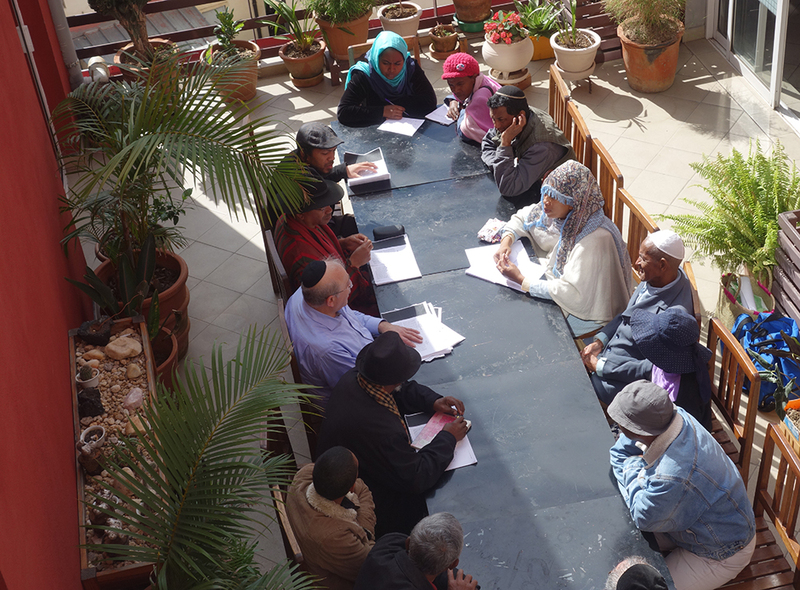 I had come to Antananarivo, the capital of Madagascar, with a delegation of 16 people associated with Kulanu, a New York based non-profit dedicated to supporting isolated and emerging Jewish communities worldwide. 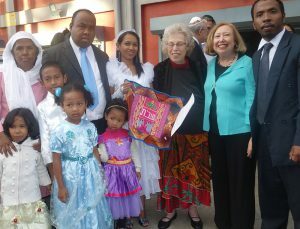 Starting in 2013, several travelers had alerted us to a group of local people in Madagascar who were learning about Judaism via the internet and leading Jewish lives. They observed Shabbat, celebrated the holidays, and eschewed non-kosher foods in favor of vegetarianism. When our intrepid vice-president, Bonita Sussman, received these messages, she got to work with the help of Yakov Zamir, an American opera singer married to a Malagasy wife. After innumerable hours connecting with leaders of the emerging Jewish community and learning that they fervently wanted to formally convert, she succeeded in organizing a beit din, a rabbinic court of three Orthodox rabbis from New York, Philadelphia, and Montreal, who were willing to journey to that far-off island in the Indian Ocean to offer their services. As the secretary of Kulanu, I was excited to accompany the beit din as a witness to some of the proceedings, especially the Jewish weddings that would follow the conversions. I was hoping to conduct an interview for my new anthology about Jewish brides around the world. I also was looking forward to meeting some lemurs, the sub-order of primates unique to Madagascar. I was not disappointed. After a warm greeting at the airport in Antananarivo, we settled into our hotel, basic (no hairdryers!) but comfortable, with a separate kitchen that could be koshered for our group meals and community rooms that we could use. The rabbis immediately began their preparations, meeting with local leaders of the prospective converts, whose numbers had risen from an original 30 to more than triple that number. The next day, some of us joined an excursion outside the city. We traveled by SUV through teeming small towns, pastoral scenes with rice paddies, lush greenery, and distant mountains to a gorgeous waterfall adjacent to a remote thatch-roofed village of mud brick huts with friendly inhabitants, many of whom wanted to sell us their handicrafts. (Madagascar is one of the poorest countries in the world, according to the World Bank.) Meanwhile, the rabbis were beginning their interviews. These were not pro-forma conversions. From morning until evening for two days, every candidate was questioned to determine his or her commitment and basic knowledge of Judaism. Some people had been studying for five years as members of one of three congregations, and others for less time. Hatafat dam brit (symbolic circumcision) was performed on the men, all of whom were already circumcised, a universal practice in Madagascar, according to community religious leaders and the rabbis. We were told that, with a few exceptions, the candidates were judged ready. The following day came the mikveh ritual that had inspired anxiety in our group. I was not there, but I was told with relief that things had gone forward without a hitch. Everyone had gathered on the riverbank. First the men and then the women and children queued patiently to enter a solidly built structure of canvas and poles stuck into the mud. It was roomy and private for disrobing, leading into the water that was neither too cold nor too swiftly moving. After submersion, and with clothing back on, the newly minted Jews emerged from the structure with gleaming happy faces. Many of the married converts opted to marry again under the chuppah, this time in a Jewish ceremony conducted by the rabbis. The next day, under sheets held by community members, a dozen couples wed in a traditional Sephardic ceremony witnessed by family and friends in a spacious room at the hotel. Led by a procession of children singing Shalom Aleichem, the beautifully dressed brides entered in a line to meet their husbands under one of three chuppahs. The rabbis spoke about the ketubahs they had signed, then the couples drank fruit punch in place of kosher wine, and grooms placed rings on their brides’ pointer fingers, as customary. In spectacular fashion, one of the rabbis sang the sheva brochot (seven blessings) and finally grooms smashed glasses as everyone joyfully clapped and enthusiastically sang Siman Tov U’Mazel Tov. Following the ceremony, a reception featured delicious hors d’oeuvres and non-alcoholic drinks amid congratulations, gifts of beautiful embroidered challah covers from a Kulanu-supported Jewish community in Ghana, an elaborate wedding cake decorated with sparklers and Mazel Tov in Hebrew, and lots of photo ops. And yes, I was thrilled to interview Ahava, an English-speaking bride and mother of three, who shared how she met her husband and how she came to Judaism. When I admired her frilly white dress, she told me that her kids had objected to the blue dress she was originally going to wear, so she and her mom had made a quick trip to the market that morning, where she found the perfect dress! I could go on about the following days, including the symposium with Malagasy speakers who affirmed Madagascar’s historical ties to ancient Jewish settlers, ideas discussed in his keynote address by well-known researcher and media personality Professor Tudor Parfitt of Florida International University. At the end of that day, the converts, some of whom had made brief remarks about what conversion meant to them, received their certificates of conversion, some with tears in their eyes. I can’t forget the inspiring Shabbat service attended by at least 150, during which the congregation participated wholeheartedly in prayer and song and local leaders chanted Hebrew expertly. It was hard to believe that they had gained so much knowledge in such a comparatively short time. Nor can I forget, in the touristic arena, seeing lemurs in their natural state in a rainforest and closer-up in a lemur reserve, as well as historic dwellings and tombs of kings and queens, congested marketplaces, and small shops selling Madagascar vanilla and spices and an endless variety of products made from raffia and zebu horn. I’m now looking forward to the fall, when I will welcome to my home Elysha Netsarh, a chemist and new Jewish convert who did an excellent job translating for us. She will be on a speaking tour around the U.S. organized by Kulanu. I hope you will have a chance to meet her, too, to learn more about Madagascar and her journey to Judaism. Barbara Vinick, an HBI Research Associate, is the secretary of Kulanu. To learn more about the organization, visit www.kulanu.org. Wow Barbara! What an amazing and meaningful adventure. We are so proud to know you! Hope to hear more and see you soon at Shirat Hayam. Well said Barbara, it was a pleasure to share this experience with you all..! It was wonderful to share this experience with you all! great and well said article..
Barbara you are wonder – I so enjoyed your narrative which was filled with such admiration for the newly converted. It is a true mitzvah that you and kulanu undertake. what a beautiful piece. 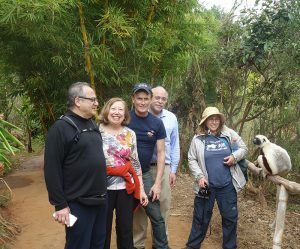 Thank you Barbara for this summary of your trip and for the work you and others in Kulana are doing to support people around the world who wish to embrace Judaism. what an amazing experience for everyone. Look forward to hearing about any other articles. And congratulations to all the new converts. What an amazing experience for everyone. Congratulations to all the new converts. Barbara, thank you for sharing this. Nice narrative, great pictures. What a great story! Barbara what an awesome experience you are a very special person. It sounds like this was a wonderful trip and it gave me a better idea of what Kulanu does. TODA RABBA for all you’ve done for Madagascar Jewish Community! We’re happy to seek for our roots. what a remarkable adventure. And what a mitzvah for Barbara. Kol Kavod.